For a wedding cake, you can use a cake mix rather than creating a wedding cake from scratch to help keep the overall costs down. 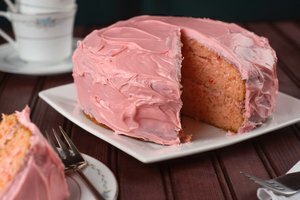 Though cake mixes have come a long way over the past few years, they are still very delicate and moist when baked. 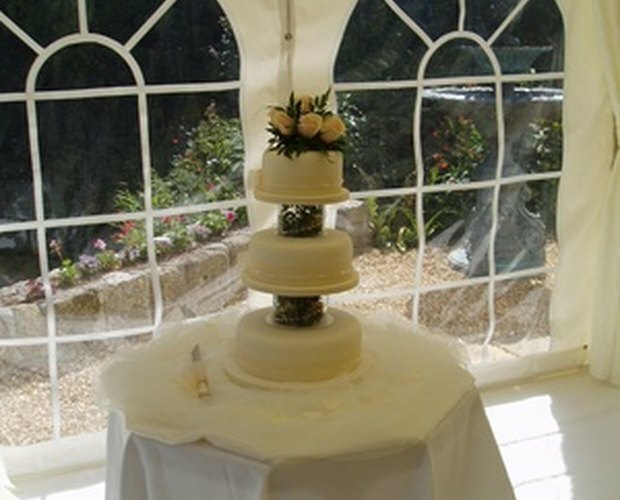 To create a stable wedding cake, you have to firm up cake mix while still maintaining that moist and delicious flavor. Depending on the brand of cake mix used, the recipe can be modified with a few simple additions. Preheat oven to 350 degrees. Combine one Betty Crocker cake mix, 2 eggs, 2 egg yolks, 1/3 cup vegetable oil, 1oz. chocolate or vanilla pudding mix and 1 1/4 cup milk into a bowl. Milk will add density to the cake mix and eggs contain protein, which will firm up the texture. 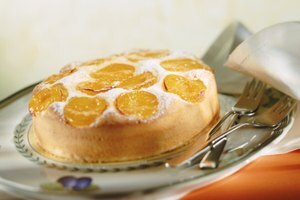 The pudding will add firmness to the cakes as well. Mix on low speed with an electric mixer for 30 seconds. A correlating pudding mix should be used with the appropriate cake flavor to prevent changes to the flavor and color. For example, a white cake mix should use a vanilla or other white form of pudding mix. Mix the batter for another two minutes on medium speed until lumps have disappeared. Pour the batter into prepared cake pans and smooth with a spatula or spoon. Tap the bottom slightly to remove any air bubbles. Place cakes in the oven and allow to bake for the time listed on the box. Check on your cakes throughout the baking process, but do not open the oven door until the timer has gone off. Baking times should be used as a guideline. Remove cakes from the oven when a toothpick inserted in the center comes out clean. Allow to cool on a wire rack for 10 minutes before removing from the pan. Cool cakes completely prior to frosting or wrapping for storage. Preheat oven to 325 degrees. Prepare cake pans and set aside. Combine Pillsbury cake mix, 1 cup sour cream, 3 whole eggs, 1/4 cup water and 1/4 cup oil in a bowl. Pudding is not added to Pillsbury cake mixes because they already have pudding mix incorporated into them. Sour cream adds moisture and density to the cake just like milk. Mix the ingredients for 30 seconds on low. Increase the speed to medium and mix for another 2 minutes or until batter appears smooth. Pour batter into your cake pans and smooth with a spatula. Place in oven and bake according to baking times listed on the box. Some cakes will take longer depending on the size of the pan. Remove the cakes from oven when a toothpick inserted in the center comes out clean. Cool on a wire rack at least 10 minutes prior to removing from cake pans. Cool cakes fully before wrapping or frosting. 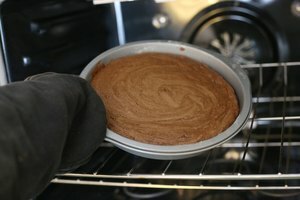 Baking 911: How to "Dense-Up a Cake-Mix"